By Mark Seewald, Vice President, Station Operations, Colorado Public Television, Channel 12, Denver, July 2018. DENVER—Colorado Public Television has a great history of technology innovation. We’ve produced multiple Emmy Award-winning shows and were one of the first digital TV stations on the air. This year we decided to expand master control automation, video servers, storage and branding and invited all major vendors in for demonstrations. Aveco stood out dramatically in software features—with many of their most impressive capabilities not found in any other system. For one, Aveco has equipment-pool facility management that dynamically assigns resources based on need. For example, in scheduled ingest, a video server port is assigned automatically, the route is locked and, when completed, resources return to the pool. In playout, if a primary video server fails, the 1:1 backup goes instantly to air, but now a new backup can automatically be built. Our senior staff member who approves media needs to go between edit suites. Whenever a promo approval is required, he selects the media and Aveco automatically assigns a Harmonic output, path-find through the router and delivers video to his room’s monitor. Facility management is invaluable in the large national TV networks Aveco runs—but it’s also very helpful for smaller stations. Aveco’s Media Asset Management includes workflow rules that reviews the on-air schedule to determine the priority of transcoding in our Rhozet/Harmonic. When a promo or program arrives late, it’s instantly moved to the top of the processing list. Aveco’s MAM has sophisticated video search, so operators can easily search-and-replace clips. It can automatically output CableLabs VOD specs and streaming media; we’re not using this yet but we can see how easy and inexpensive it is to grow. Aveco automatically brings in media from the archive to the on-air video server according to on-air playlist schedules. It also implements our policies of where and when to store media, including checking space on storage subsystems; when they reach fullness-thresholds, it automatically begins using the next available system. This intelligent storage management includes purging rules based on media types, future reruns, etc. There’s almost no limit to how efficient media operations can mature using Aveco’s workflow manager. We’ve used Harmonic/Omneon video servers for years and we’ve seen how fully Aveco implements every nuance of the Harmonic APIs. We’re very happy to make a major upgrade to the new Harmonic Spectrum X under Aveco control. In traffic, Aveco was the industry’s first MCR automation to implement BXF 5.0, and, more impressively, it had dynamic traffic interfacing over 20 years ago, long before BXF. Dynamic traffic interfacing makes it easy to handle changes. The Aveco-traffic interface also allows dynamic “coming up tonight,” “coming up next” promos in real-time on-air through Aveco controlling the Harmonic Spectrum X branding overlays of graphics-video-audio. This greatly reduces editing time in the repetitive tasks of compositing regular promos, letting editors work on higher value content. Aveco uses QNX, a real-time operating system common in Cisco switches, Boeing aircraft, etc. Software clients are on Windows, Mac and Linux, with all three OS clients operating simultaneously—locally and remotely. QNX has never had even one virus or worm. It’s POSIX-compliant and easily supported and looks like Linux. Access is only by a software client. Having a safe, reliable core will be increasingly important as the industry moves further into IP. Aveco has a truly remarkable platform; we’re proud to work with them and would welcome any broadcaster to come visit us in Denver. We’d be happy to show you what we determined is the current state-of-the-art in master control automation. 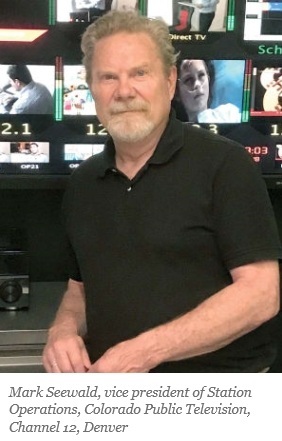 Mark Seewald is a 35-year broadcast technologist at Colorado Public TV (14 years), DirecTV and other companies. Mark can be reached at mseewald@cpt12.org. For more information, please visit www.aveco.com or call 818-292-1489.